Cake for breakfast! This hearty oatmeal is creamy, decadent, and healthy all at the same time. Steel-cut oats and and finely shredded carrots simmer together with milk, a touch of maple syrup, and comforting spices until you've got ultra-creamy heaven-in-a-bowl. I don’t know what’s up with me and carrot cake lately, but I want to make carrot cake everything. Pancakes, waffles, cookies, oatmeal. It’s almost pumpkin-level, and for that, I apologize to my dear significant other, who still can’t fathom the idea of pumpkin in anything after my pumpkin-everything frenzy last fall. I guess it’s because I keep buying carrots and then I see them in the fridge and I get obsessive about using them up before they go bad. Plus, now that I’ve started a compost bin, I love adding another little pile of carrot peels to the scrap bin. Who knew how satisfying it would be to collect kitchen scraps and throw them onto a big pile of more scraps and yard debris? Now if I can actually get some compost out of the deal, I’ll be golden. 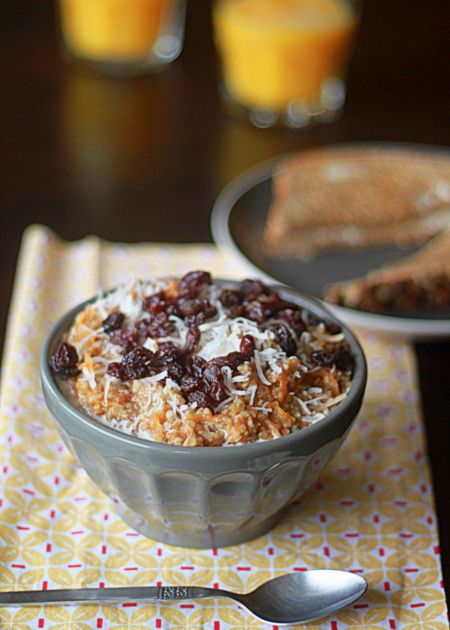 Oatmeal has always been a breakfast staple for us, but never more so than now. It’s on the breakfast menu at least every other day because it’s a sure-fire toddler pleaser in our house, especially since I started giving her her own bowl (which she promptly dumps on her high chair tray and then shovels to her face with her hands). And then as I praised myself for my original, creative idea, I made the mistake of Googling it, and naturally, some other amazing bloggers had already beat me to it. Don’t these people know they shouldn’t go stealing my ideas before I have them?! Oh, wait. 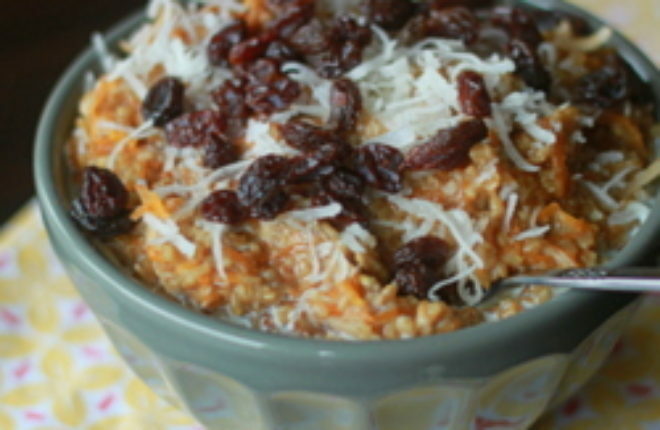 As luck would have it, fabulous blogger Angela of Oh She Glows created and shared a vegan version of carrot cake oatmeal a couple of winters ago. Bless her for saving me the trial-and-error mayhem that can go along with developing recipes. I used Angela’s recipe as a rough guide, using steel-cut oats instead of rolled and de-veganizing it along the way (I hope she doesn’t mind – and it is easy to re-veganize, just sub coconut milk for the cow’s milk). This hearty oatmeal is so delicious, so creamy, so decadent and yet healthy all at the same time. While it cooks, it sends the most wonderful comforting scent throughout the house. I love that. The oatmeal and carrots simmer together with milk, a touch of maple syrup, and spices until you’ve got ultra-creamy heaven-in-a-bowl. 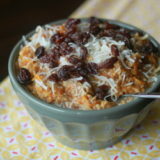 We find that with the carrots and syrup, it’s already plenty sweet, so just spoon into bowls and pass with raisins, shredded coconut, and walnuts to sprinkle over the top. To a medium saucepan over medium heat, add the oats, carrot, coconut, milk, water, maple syrup, cinnamon, nutmeg, ginger, and salt. Bring to a boil then reduce heat. Simmer for about 20 - 25 minutes until the oatmeal is tender and creamy. Remove from heat and stir in the vanilla extract. Serve with a splash of half-and-half or coconut cream along with shredded coconut, raisins, and walnuts sprinkled over the top if desired. I, too, love everything carrot cake! Being able to eat it for breakfast is perfect! Right?! Cake for breakfast – the perfect excuse. 🙂 Thanks! i hate that when you have a perfect seemingly-original idea only to have it show up on pinterest or google. I usually just find a way to tweak it and mention the originator the way you did. Anywho, this.looks.amazing! i need it for breakfast soon! For a lot of stuff I really think the best idea is to resist Googling it … unfortunately I have a hard time resisting! That would be the perfect flavor for a wedding cake – especially for awesome farmers. 🙂 Love. You know, I still think about your carrot muffins all the time. I need to get my husband to make those for me again. And then he can make this for me too. It looks amazing! This sounds amazing!! Definitely making this soon. Carrot cake anything is heavenly. Pinned! All that’s missing is the cream cheese frosting! Except that would be gross on oatmeal, wouldn’t it?! I was just drooling over your soft peanut butter M&M cookies. YUMMM. This sounds like such a great way to start the day – healthy and yummy! I’ll have to give it a try. I love oatmeal for breakfast – especially when it tastes like a dessert! This looks like such a good idea – I love it! Can’t wait to try this! Oh my goodness! 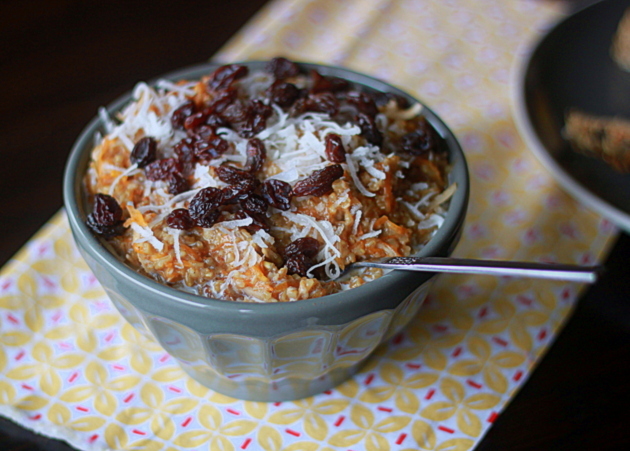 Carrot cake oatmeal!? Awesome idea! I have to make this over the weekend. Looks awesome! I haven’t gotten to make anything with carrots recently, but I’m looking forward to it and this recipe will have to be one I try. I’m currently shoveling this into my mouth, SO GOOD!!! A little scoop of walnuts on top. Using almond milk, it’s only 221 calories for 1/4 recipe (plus 1T walnuts). Amazing breakfast!! So sorry, I totally miscalculated! It’s actually about 269 calories without any toppings. However, with 7g fiber and 6g protein, it’s still light enough to be a great, healthy breakfast! Thank you for calculating this! That’s still less calories than I would have thought. Love it. Made it this morning. It is ABSOLUTELY delicious! Pingback: Carrot Cake Steel Cut Oatmeal #Brunchweek - It's Yummi!